Free jailed Kazakhstan oil workers! 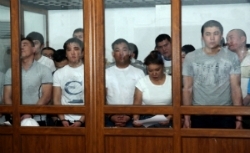 The struggle for their release is being led by the independent trade unions of Kazakhstan, Russia, Ukraine, Belarus and Georgia and their international supporters including the IUF. It is a struggle for the right of all workers in Kazakhstan to unite, to strike and to struggle for decent working conditions, freedom of expression and a decent life.